Mod: I am pretty sure that this was all set into motion by the presence of residents unhappy about their water bills at the last City Council meeting. As you may recall, there was one resident in particular who had one in excess of $1,000 due to their being billed at the winter rate in the middle of summer. However, it appears that this will not be limited to just that topic, as important as it is. I wrote to City Manager Engeland and this is what I learned. Tattler: Will the bond debt and its influence on infrastructure repairs and water bills be discussed? City Manager Engeland: I'm sure it will. We are setting this up as a question and answer session on any water topic people have--though I anticipate we will answer non-water questions as well. So far people have said they are going to ask questions on the (Prop) 218 process, bond debt, water loss, UUT, and how we compare to peer cities with regards to rates and fixed charges. We aren't preparing a presentation for the meeting, but will have slides on topics we expect to be asked about. My guess is we will have multiple questions on debt and how it drives rates. Mod: That would certainly be interesting. 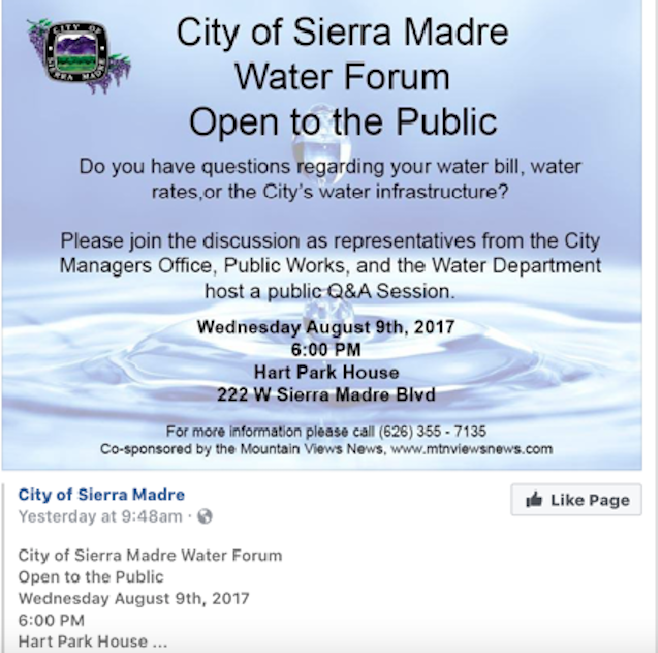 As I am sure you know by now, Sierra Madre's water bond debt is in the many millions of dollars, and does take hundreds of thousands of dollars away from needed water projects in town every year. All at the expense of city water ratepayers. Unbelievably enough, an open public discussion about this with city officials would be a first. A true "bringing the elephant out into the open" moment for sure. Of course, some bold individual will need to bring it up. 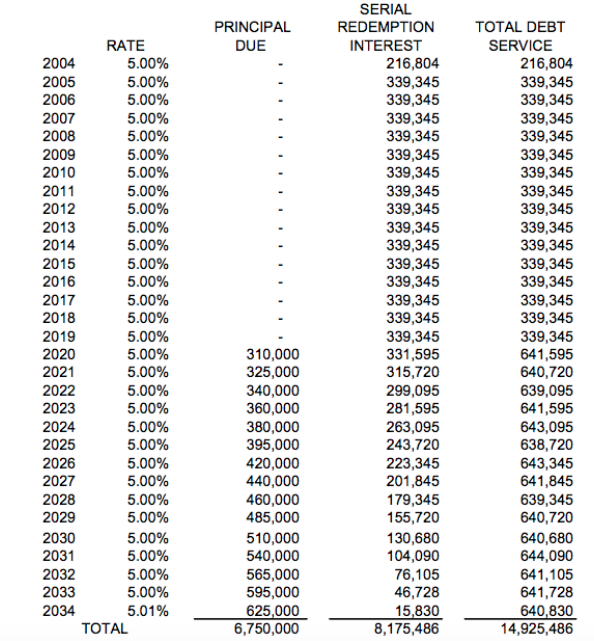 As a friendly reminder, here is a schedule of that debt. Due to the city's bizarre repayment scheme, the cost of the interest on this particular water bond alone is well over $8 million dollars, and is being paid in yearly increments through the distant year of 2034. Payments on the principal do not begin until 2020, a full 16 years into the repayment schedule. Those numbers have bounced around at a few City Council meetings, no suprise on the information. The suprise comes when one says to themselves, what were they thinking? It was not all that long ago that the Water Department was fine on it's own, no deficit in sight. When attending Council meetings this type of info needs to be discussed by Council members, not just relying on the department heads to do their job. Question why, not just bob your heads up and down in agreeing. This applies to past city councils that neglected to look fiscally into the future, but looked rather to the over development of Sierra Madre as a means of bailouts. City Hall has new and qualified individuals in place now, the citizens are left to clean up the mess. Again, much to be said about making the time in our days on Tuesday evening's inorder to attend City Council meetings. The city council has yet to acknowledge this debt, and instead would prefer that staff deal with explaining it to the residents. Things won't get better if people do not speak up, ask questions and call out the BS. Is the city replacing the water in the settling basins? How are the aquifers and the water levels? How long must the city import outside water? Just some of the questions I will ask at the meeting, along with my billing. Are the water fines permanent? Will this end up like the UUT, something that was put in for a temporary purpose, but then never went away? Once a revenue stream is opened in Sierra Madre, it never goes away. Before the Council voted on the water measure fines, quite a while ago, I went to the podium and asked for the Council to please put a sunset clause on the measure, they chose NOT to do so. There was just a handful of residents there that night. It frustrating that few come to the meetings. With such little opposition, the Council moves ahead and votes for approval of the measures. The City of Sierra Madre should start selling bottled water to pay for costs. Not to make a profit but to pay for costs "debt". THE SIERRA MADRE WATER BOTTLING COMPANY could sell this water to the restaurants and businesses in town for resale or use. The city could get creative with the water and logo's that will make it talked about, marketing is the name of the game, not to mention buying good clean water locally that you know is good is a big deal $. The only problem with that is where would we get the good water? Possibly buy some from Arcadia? I go to Pasadena , bring my own bottles, and purchase water from the big vending machine. Why are there no water vending machines in Sierra Madre? #1 Yes constantly. #2 Low Look at the chart in Kersting Ct. #3 Until we have a sufficient water supply of our own. Your billing is easily read,it's expensive but needs to be raised even higher. Attorneys General Sessions is investigating "leakers" let the City be warned! In this City, the City is the leaker. Infrastructure that is. City pipes leaking so much, wasting water! All of the council members that passed the 10 times penalty all have tiny properties with very small yards. Their condos and yards still look fine. Every year the people east of Baldwin get screwed. If we had been on summer rates, we would have been below our target. Come to think about it, the City screws everyone when ever possible. So... just cut back. This isn't Great Britain. If you want a large luscious lawn move somewhere else, this is the new normal. That or plant some endemics so you don't need to waste gallons on nonnative grasses. Just drive to Arcadia, many green lawns there...also in upper Hastings. Not in Sierra Madre, we have a DROUGHT status here, but Pasadena and Arcadia have no drought. Imagine that? I will be out of town and unable to attend the meeting. Mod if you could post the Utility Billing Chart here for someone to bring it up at the meeting a serious absurdity needs to be addressed: the WINTER including June/July for east of Baldwin and May/June for west of Baldwin and SUMMER including December/January east of Baldwin and November/December west of Baldwin. We should have caught this years ago. This split billing cycle causes hardship because the heat/drought/watering needs are the same east to west of the billing diving line. This needs to change! Please don't tell me you're understaffed and need smartmeters to read the meters on the same day throughout the whole town. 10:15am. Interesting, I had not realized the billing was split into sections, how absurd. The City always says we need more staffing to read them all in a day. A day and a half would be sufficient. I hope residents of Sierra Madre read the Tattler and remain informed of city happenings. I would not have known about this up coming event at the Senior Center except for the posting here today. Do you live here? It was in the City "Village View" newsletter Emailed today. You may want to subscribe. I have signed up for the VV several times and have yet to receive it. That's odd I never signed up but I receive it. You must be on the bad boy list. There is a list of people who are banned from receving the Village View? Is it advertised in the Mountain Views News? Banned from receiving the Village View ? Yes I had heard that information. I wonder why some are excluded? hmmm? The Mountain Views News is sponsoring it. Maybe Susan will be the moderator. In which case look for written questions only with yours likely not chosen. 5:48 - Never suspect conspiracy when the far more obvious answer is incompetence. As I recall our BlogMeister is a persona non grata on the VV,or was it the MVN? "Is it advertised in the Mountain Views News?" Who knows nobody reads it. The City should post the notice at Starbucks, Beantown, etc. The business store windows are great places to notify residents about the meeting! Also in the Kersting Court Bulletin Board. I used to write for that paper when it was under the original ownership. After Susan took over large portions of my column began disappearing. That is when I decided it was time to go it alone. This should be a hardy har har or a meeting. Hopefully this will be a meeting. I also have difficulty receiving the information on line about the city, but I am pleased that there is a reaching out from City Hall along with a transparency this town has not seen in many, many, many years. Didn't the property billed $1,000 use an average of about 1,600 gallons of water per day? If every household in SM used that much, it would be over 7.7 million gallons per day, or nearly 12 Olympic sized swimming pools per day, not counting municipal and business water use. Exactly. They need to pay up, or more smartly use less. These penalties should not go away, and if people are angry about them they need to look in the mirror (meter). The water fines are a de facto rate increase. Permanent and probably getting worse. There is now plenty of water. The mountain snow pack this winter set records. It is not the fault of the rate payers that city hall made a bad deal with the SGVMWD. I guess we're now funding their retirements as well. I'll bet no more than the regulars show up,maybe 20 people. I would go if the In-Out truck was there or sumpin. If people don't do their civic duty they will be screwed. Then they act all surprised. The water mess is a good example of that. $8 million in debt service on a $6 million dollar bond. Must be a Guiness Book world record. People are busy and overwhelmed, which is why we have a representative democracy - so we trust our elected representatives to protect us. Yeah, I know. Big mistake.